Whole Body Cryotherapy isn’t just for the professional athlete. Celebrities and athletes love cryotherapy for the same reasons. Clients rave about whole body cryotherapy and the numerous recovery benefits they feel they experience. You can experience whole body cryotherapy at the Chill + Heal, the Premier Cryotherapy Spa located in Shreveport, Louisiana. GRAND OPENING AUGUST 2016. Want to read more about cryotherapy? Keep reading below. Staying in good health and great shape takes a lot of discipline and good practices. You must eat well and exercise in order to reap those benefits, and not to mention, put in a lot of hard work. One of the newest additions to the health and wellness routine is whole body cryotherapy. What does whole body cryotherapy offer? Whole Body Cryotherapy offers benefits to it’s participant almost immediately. Clients have stated that they feel amazing after just one quick three minute session. Participants have claimed to feel better, sleep better, notice tightened and toned skin, reduced pain and inflammation, and more. Athletes have even said they feel they can recover faster and can increase their performance because of it. It’s no wonder that celebrities and athletes love cryotherapy and why cryotherapy spas are opening up all across the United States to keep up with the demand for whole body cryotherapy. One quick google search and you can probably find your favorite celebrities and athletes like Demi Moore, Kate Moss, Lebron James, Jennifer Anniston, Jessica Alba, (and many more,) doing whole body cryotherapy. Some retired professional athletes have felt the benefits of cryotherapy to be so great they have opened up their own cryotherapy business, like professional baseball player James Shields. It’s definitely one you will have to experience first hand to fully understand. 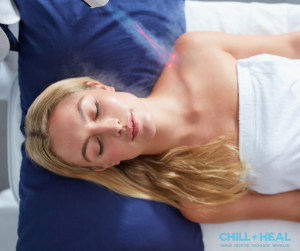 Stop by the CHILL + HEAL SPA for 50% off your first whole body cryotherapy session, and check out our amazing memberships available! You can follow us on Facebook and Instagram for more information. Still looking for more information? Check out our Cryotherapy Frequently Asked Questions page.